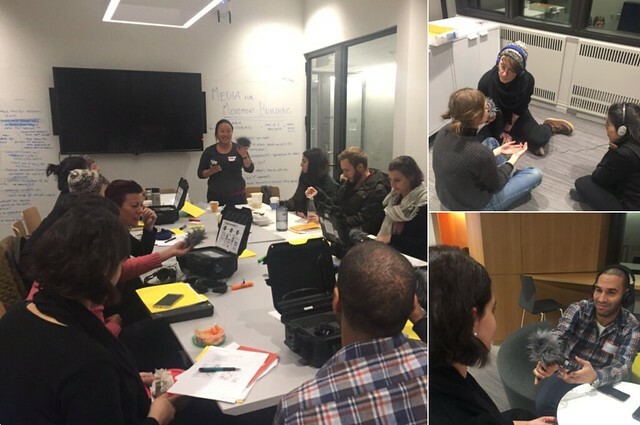 Media for Movement Building is a two-week, hands-on audio production workshop exploring urban planning issues in East Boston through multiple lenses. The course, co-taught by Marie Choi, a producer from Making Contact, and Lawrence Barriner II, CoLab Radio’s Interim Program Director. There are 12 participants, including two young media makers and one staffer from ZUMIX (an East Boston-based organization that is a partner with the course), two adult East Boston residents, and several MIT and Harvard students and researchers. This 8-post series is a play-by-play of each day of the course. It is meant to be a publicly accessible record of our activities, but could also serve as a resource for others interested in leading similar workshops. Photos and a headline for each day of the workshop can be found on Twitter via the hashtag #MovementMedia. Day 1 of the class began with an overview and brief introductions, including the question: if you could interview one person, dead or alive, who would it be? Then we had a few brief discussions about goals for the course, what participants want to get out of it, and built a list of community agreements. What would you do differently/what didn’t you like? Next, we spent an hour learning about our audio recording equipment. We talked about the technical details of gathering good audio and then jumped into trying it out by telling each other stories from the places where we grew up. At the end of the class, we split into our recording teams, learned about each group’s interview assignment, aired grievances, and planned for day 2.